Survey of landscape suggests prehistoric monument was surrounded by two circular hedges. The Monty Python knights who craved a shrubbery were not so far off the historical mark: archaeologists have uncovered startling evidence of The Great Stonehenge Hedge. banks. The best guess of the archaeologists from English Heritage, who carried out the first detailed survey of the landscape of the monument since the Ordnance Survey maps of 1919, is that the hedges could have served as screens keeping even more secret from the crowd the ceremonies carried out by the elite allowed inside the stone circle. Pitts wonders if the hedges might have been to shelter the watchers from the power of the stones, as much as to ward off their impious gaze. 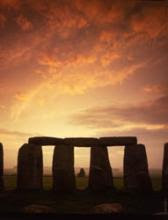 If the early Bronze Age date is correct, when the hedges were planted the Stonehenge monument already had the formation now familiar to millions of tourists, after centuries when the small bluestones from west Wales and the gigantic sarsens from the Stonehenge plain were continually rearranged. The survey also found puzzling evidence that there may once have been a shallow mound among the stones, inside the circle. It was flattened long ago, but is shown in some 18th century watercolours though it was written off as artistic licence by artists trying to make the site look even more picturesque. The archaeologists wonder if the circle originally incorporated a mound which could have been a natural geological feature, or an even earlier monument.